The primordial gods or "Protogenoi" of Greek mythology were the most basic components of the universe which emerged fully-formed at creation. They included Earth, Air, Sea, Sky, Fresh Water, Underworld, Darkness, Night, Light, Day, Procreation and Time. The first born of the immortals, who formed the very fabric of the universe, were known in Greek mythology as the Protogenoi (protos meaning "first," and genos "born"). They were, for the most part, purely elemental beings - Uranus was the literal sky, Gaea the body of the earth, etc. 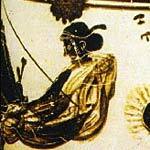 A few of them were ocassionally described or portrayed in anthropomorphic form, however these forms were inevitably inseperable from their native element. 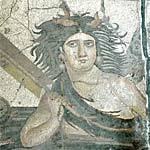 For example Gaea or Thalassa might appear as a woman half risen from the earth or sea. AETHER (Aither) The Protogenos of the mists of light which fill the upper zones of air. His element lay beneath the arch of heaven's dome, but high above the airs of the mortal realm. ANANKE The Protogeonos of inevitability, compulsion and necessity. She was the mate of Chronus (Time) and like him was an incorporeal, serpentine being who twisted circling around the whole of creation. CHAOS (Khaos) The Protogenos of the lower air. She filled the gap between the bright mists of the heavenly aither and the floor of the earth. From Chaos were descended the other airs: Erebus (darkness), Nyx (night), Aether (light), Hemera (day); as well as the birds. Only late classical writers describe Khaos as a primeval mixture of the elements. 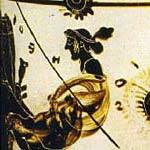 CHRONOS (Khronos) The Protogenos of time was the very first being to emerge at creation self-formed. He was a three-headed, incorporeal being with serpentine tail, who circled the whole of creation, entwined with his consort Ananke. EREBUS (Erebos) The Protogenos of the mists of darkness. His dark element was sunk into the hollows of the earth, and encircled the dismal realm of the underworld. EROS The Protegonos of generation. 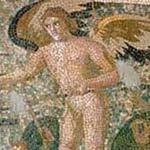 He was known as Phanes or Protogonos, distinguishing him from the younger Eros, Aphrodite's son. He was one of the first beings to emerge at creation, and caused the universe to procreate. GAEA (Gaia) The Protogenos of the earth. Mother Earth emerged at the beginning of creation to form the foundation of the universe. 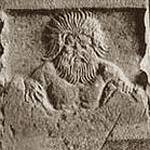 Gaea was one of the few Protogenoi to be depicted in anthropomorphic form, however even as such she was shown as a woman partially risen from the ground, inseperable from her native form. HEMERA The Protogenos of the day, rose up from the ends of the earth to scatter the dark mists of night, spread across the heavens by her mother Nyx, and reveal to the earth below the bright shining blue of the Aether, her protogenic consort. HYDROS The Protogenos of water. Together with the earth he formed the primeval Mud. 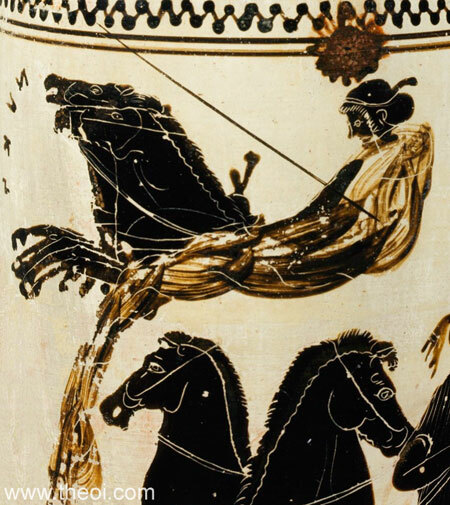 Hydros was usually equated with the earth-encircling, fresh-water Titan Oceanus. NESOI The Protogenoi of the islands. Their rocky forms were broken from the earth by Poseidon and cast into the sea. NYX The Protogenos of night, Nyx drew the dark mists of her consort, Erebus, across the heavens at night, cloaking the bright light of the heavenly aether. Her anthropomorphic form was of a woman clothed in star-spangled mantle. 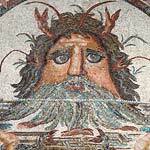 OCEANUS (Okeanos) The Protogenos of the great earth-encircling, fresh-water river Oceanus. From his flow every river, spring and rain-bearing cloud was sprung. 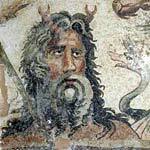 His anthropomorphic form was that of a horned man with the tail of a serpentine fish in place of legs. OUREA The Protogenoi of the mountains. Their rocky forms were born of Gaea the Earth. PHANES The Protogenos of generation, the creator-god. He was sprung from a silver egg, the seed of creation, at the beginning of time, and set the universe in order. 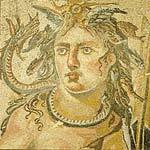 Phanes was also named Eros or simply Protogonos (the First Born). According to some Zeus swallowed him whole o gain supremacy over the universe. PHUSIS The Protogenos of nature. 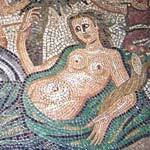 "Mother Nature" was one of the first beings to emerge at creation. She was related to both Gaea and Tethys. PONTUS (Pontos) The Protogenos of the sea. He sprung from Gaea the Earth at the beginning of creation, when the elements of the universe were set in their proper order. TARTARUS (Tartaros) The Protogenos of the great stormy pit which lay beneath the roots of the earth. He was the anti-heaven: just as the dome of heaven arched high above the earth, Tartarus arched beneath her. The Titans were imprisoned in his depths. TETHYS The Protogenos of the flow of fresh-water. She was an aspect of all-nourishing Mother Nature. From Tethys and her husband Oceanus the rivers, springs and clouds drew their waters. THALASSA The Protogenos of the sea or sea's surface. She was born of Aether (light) and Hemera (day). Mixing with the deep waters of Pontus (sea) Thalassa spawned the schools of fish. THESIS The Protogenos of creation. She was similar to Tethys, Mother Nature's great nurse. URANUS (Ouranos) The Protogenos of the solid dome of heaven, whose form stretched from one horizon to the other. He sprung forth from Gaea the Earth at the beginning of creation. Later his son Cronus, seized and castrated him, as he descended to consort with Mother Earth. "Declare to me from the beginning, you Mousai who dwell in the house of Olympos, and tell me which of them first came to be. In truth at first Khaos (Air) came to be, but next wide-bosomed Gaia (Earth), the ever-sure foundation of all the deathless ones who hold the peaks of snowy Olympos, and dim Tartaros (the Pit) in the depth of the wide-pathed Earth, and Eros (Love), fairest among the deathless gods, who unnerves the limbs and overcomes the mind and wise counsels of all gods and all men within them. 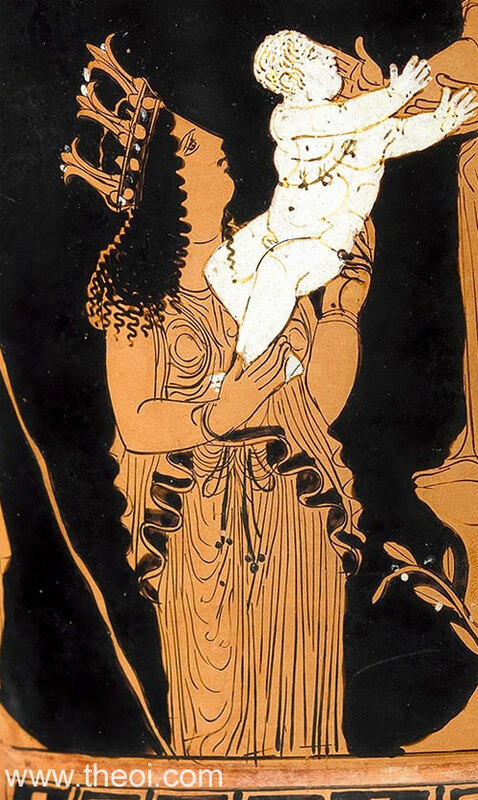 From Khaos (Air) came forth Erebos (Darkness) and black Nyx (Night); but of Nyx (Night) were born Aither (Light) and Hemera (Day), whom she conceived and bore from union in love with Erebos. And Gaia (Earth) first bore starry Ouranos (Heaven), equal to herself, to cover her on every side, and to be an ever-sure abiding-place for the blessed gods. And she brought forth long Ourea (Mountains), graceful haunts of the goddess Nymphai who dwell amongst the glens of the hills. She bore also the fruitless deep with his raging swell, Pontos (Sea), without sweet union of love. 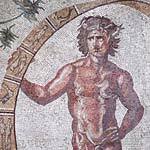 * The Romans preferred the Greek name Uranus over the Latin Caelus for this god.